A plumber aspiring to become a professional singer, a doting brother, and a devoted father are the grand winners at this year's 'Camp ka Champ' (Champ of the Camp) held on Thursday in Jebel Ali. Trading a spanner for a microphone that night, Lovepreet Singh, 23, from Punjab in India moved like a natural performer, showcasing his powerful and rhythmic voice as he turned the open football field at Nuzul staff accommodation into his own concert arena. 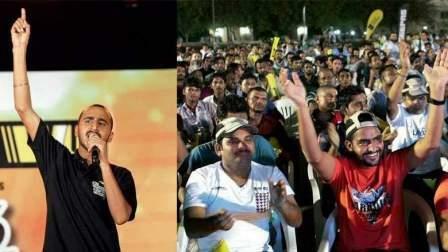 He was declared 'Singer of the Season' from among more than 4,000 migrant workers from 15 countries who auditioned for the 11th edition of Western Union's biggest annual singing competition for workers in the UAE. Lovepreet's win was also propitious as he performed on the eve of his music idol's Ustaad Nusrat Fateh Ali Khan's 69th birthday. Lovepreet, who works as a plumber, received numerous prizes, including a cellphone, electronic gadgets, vouchers and Dh15,000 cash prize. Speaking to KT, he said he will use his windfall profit to enrol in a music school and become a professional singer. "Singing is my life. I want my voice to be heard from Jebel Ali to the world." Lovepreet added that like his favourite song, Kadi aa mil sanwal yaar ve (loosely translated as Oh beloved, come back to me someday), he too wants to return to his motherland as a successful singer. He said with his win in the competition, he can say that he did not leave his family and home in despair. Meanwhile, Abdul Nadeem Khan, 30, from the northern Indian state, Rajasthan, was teary-eyed when he and his team mate Juber Nazmudin Khema, 35, from Mumbai received a big mock-up check showing Dh35,000. Abdul Nadeem and Juber, used their extensive knowledge of Hindi film songs, actors, and trivia to get ahead of the other teams. Juber, a father of two, said cheerfully: "I was picturing in my mind a house for my family and it served as my biggest motivation. The money (around three lakhs rupees) may not be enough to finish constructing a two-bedroom house but at least I have something to start with building that dream home."